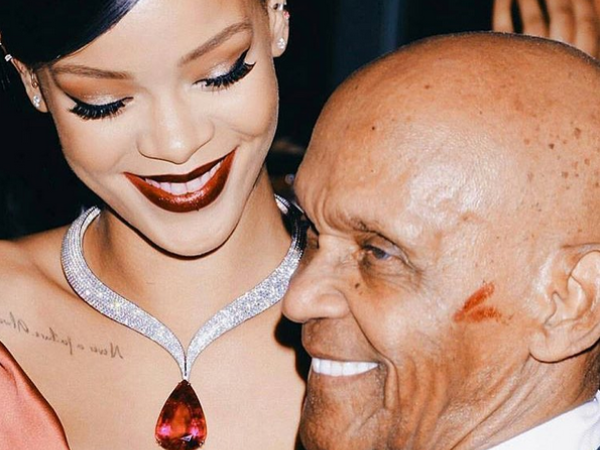 Rihanna posted a touching message to celebrate her grandfather's 88th birthday on Saturday. The Barbadian singer took to social media to share a sweet snap of one of the most important men in her life, and she described how he met her grandmother more than 60 years ago. "Captain of the ship... my grandfather #Bravo," she captioned the image of her with her grandfather. "Such an inspiration to the 4 generations that came after you (so far) and as a result of you! It was ‘only’ 61 years ago that you met my 17 year old grandma #Dolly and bought out her entire tray of mangoes, just so she didn't have to work and could spend the rest of the day with you! The ship from Barbados that you worked on left you in Guyana that day!! Read more: Rihanna just bought a beautiful Barbados mansion for her dad "I bless God for that day... it was the beginning of many blessings to come! My whole existence depended on that very day!" Rihanna touchingly wrote. "Your strength, love, prayers, discipline, sense of humor and STUBBORNNESS are just a few of the things we love about you, and why you're truly our guardian angel sent to us from Heaven! "I love you with all my heart, and I'm so happy that God spared you to see the 88th year of your life!!! HAPPY BIRTHDAY OG!!!" she concluded, calling her grandfather an "original gangster". According to Entertainment Tonight, the Umbrella hit maker has been spending quality time with her family following her split from Drake last month. While Rihanna is apparently embracing the single life, rumours are swirling her Hotline Bling ex-boyfriend is romancing Taylor Swift, following her split from Tom Hiddleston. After the rapper's 30th birthday party, Drake shared a photo of the pair with their backs to the camera at the private event. “Is that velvet?” he captioned the photo. However, other sources have insisted the couple are just friends and have been collaborating in the studio.